Mont Saint Michel, a magical island in Normandy is one of the most visited places in France. It’s topped by a medieval monastery that almost seems to defy gravity. This is undoubtedly one of the most stunning sights you’ll see during your visit, and it has even been declared a UNESCO World Heritage Site. 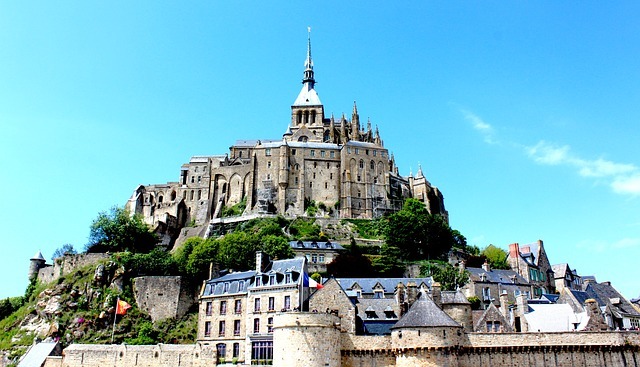 Listed below are 5 places that you can visit when you’re in Mont Saint Michel ! The main street in Mont Saint Michel is called La Grand Rue. It’s a busy street is filled with lovely small shops and cozy cafes, and it looks more like something straight out of a storybook. Although this place is usually packed full of tourists, you can duck into any one of the cafes and take a break from the crowds while sipping a cup of coffee. This is a very unusual and impressive dam that has fabulous views of the surrounding area. It also makes for a great picnic spot where you can take time away from the bustling crowds to soak in the beauty of this quaint place. When the weather is good, you’ll see some people having lunch on the stair chairs that separate the dam’s two tiers. There are free guided tours here every day at 3:30 in the afternoon. This is the place most people picture in their minds when Mont Saint Michel is mentioned, and it’s the most popular tourist venue. The abbey is open from midday till 6 pm daily, and it has beautiful courtyards, halls, and corridors that you’ll absolutely enjoy learning about if you opt for the historical guided tour. Since the eighth century, this island has had monastic establishments that are a big part of its rich history. Your trip definitely won’t be complete without a visit to the Abbaye du Mont Saint Michel. The Eglise Paroissiale Saint Pierre is a charming little chapel located about halfway to the abbey. It’s an amazing place with an aura of peace and tranquility. As soon as you step between its doors, and leave the crowds behind you, a sacred feeling envelops you. Make sure you stop to appreciate this beautiful chapel for a few moments before continuing up to the Abbaye du Mont Saint Michel. This is yet another hidden gem on this idyllic island. The Chappelle Saint Aubert is located in a place that is further out of the way than Eglise Paroissiale Saint Pierre, which means it’s even calmer and more serene. Inside you’ll find a tiny, gorgeous altar that is unlike any other. Also, the views from here are most magnificent at high tide, just be careful if the winds are as high as it can be unsafe for small children and the elderly. This breathtaking island has a surprising variety of things to do and places to see. If you’re planning a trip here, just remember to wear good shoes as some of the streets can be a bit steep.